Posted in Food, Recipes, Tutorials	by STYLEgloss. I’m going to let you in on a little secret about me. Seriously. Can’t eat ’em. I’ve tried tons of times, but I just can’t get past the texture and the taste. But cook them up in a sauce, give me a bowl of salsa and chips, add them to a deliciously sweet and sticky jam and I’ll eat that up. Twice. I first discovered the holiness that is tomato jam at Nordstrom’s Sixth and Pine restaurant. 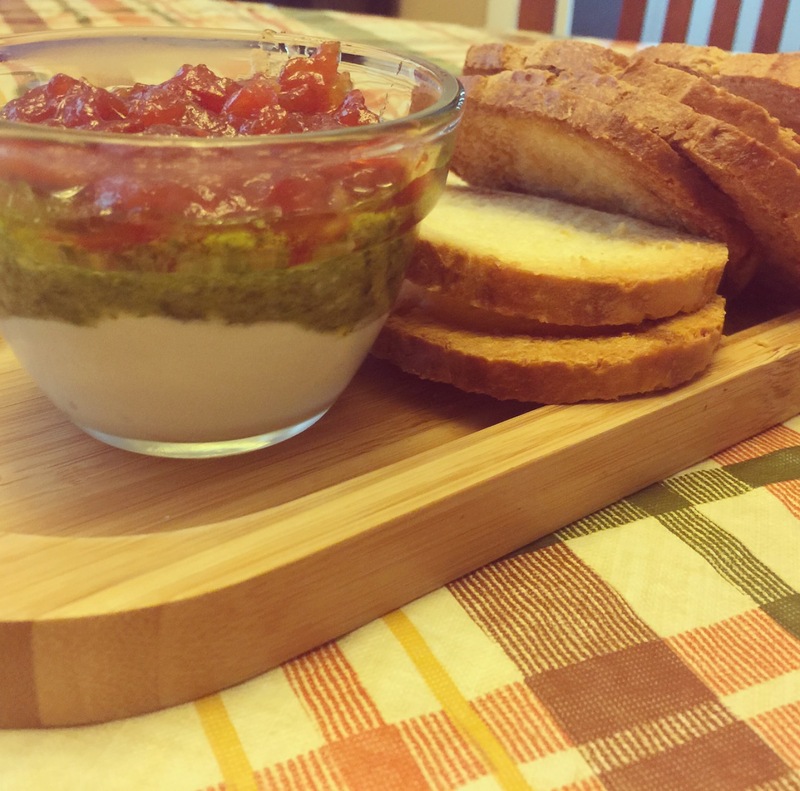 It was nestled delicately into a glass mason jar along with pesto and ricotta… hence the name tomato jam jar. Seriously, horns will play and angels will descend from the high heavens when you taste this recipe. It is that good. I promise you will want to make it for every birthday, holiday, payday and all the other days in between. Plus, it is a super easy and elegant appetizer that you can impress all your foodie friends with. They will think you slaved over a hot pot and a cutting board all week. There is no better way to use all of those home-grown tomatoes from your garden that you have right now than to make tomato jam. You can jar it and feast on your crop all winter long (how Home on the Range is that?). Now don’t get nervous but there are a few moving parts to this recipe. You’ll need to make the jam first, which is the most time consuming part. The rest is cake! STEP ONE: Preheat your oven to 350. 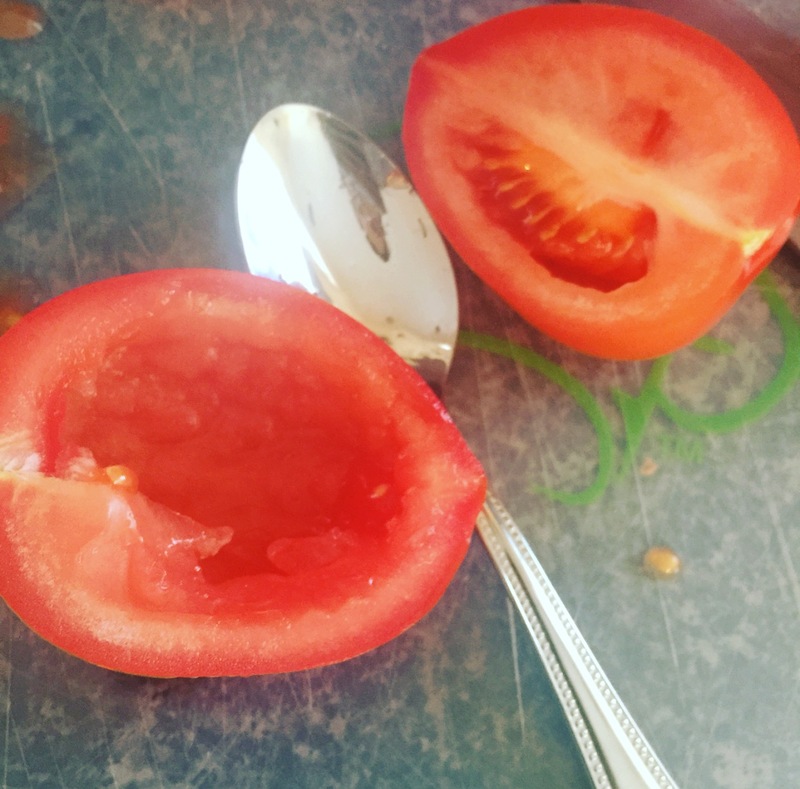 Core your tomatoes. I like to use a teaspoon to do this. Another great tip is to take the produce bag your tomatoes came in and insert it into a plastic mixing bowl. 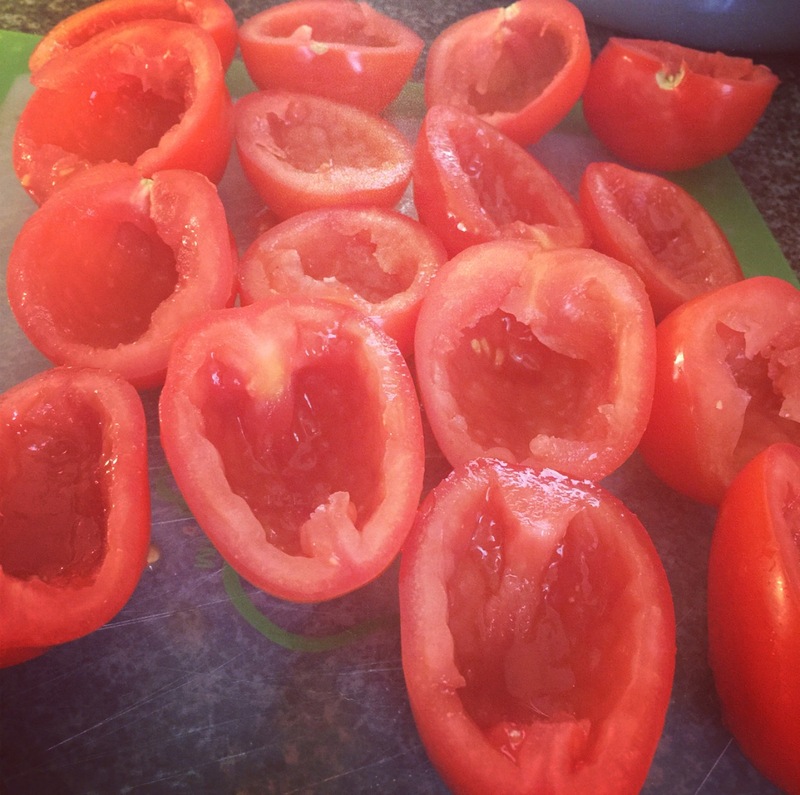 Core each tomato over the bag and then just toss when you are done for easy clean up. Genius. 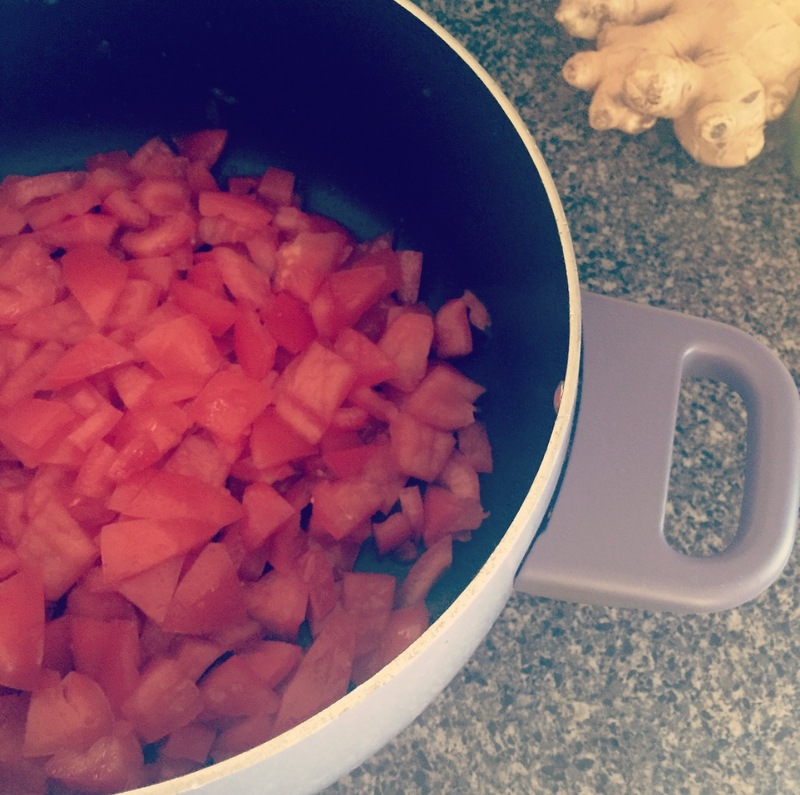 STEP TWO: Rough chop your tomatoes and place (or throw… no judgement here) into a pot. STEP THREE: Add all your other ingredients to the pot and mix. Cover and cook on medium heat, stirring occasionally for about an hour or until your tomatoes begin to look glossy and the sauce thickens. STEP FOUR: Once your tomatoes have taken on a jam-like consistency you need to make sure they are cooled before plating. Take a tray (a baking sheet will do) and line it with parchment paper. Spread your jam in a thin layer and refrigerate until cool. 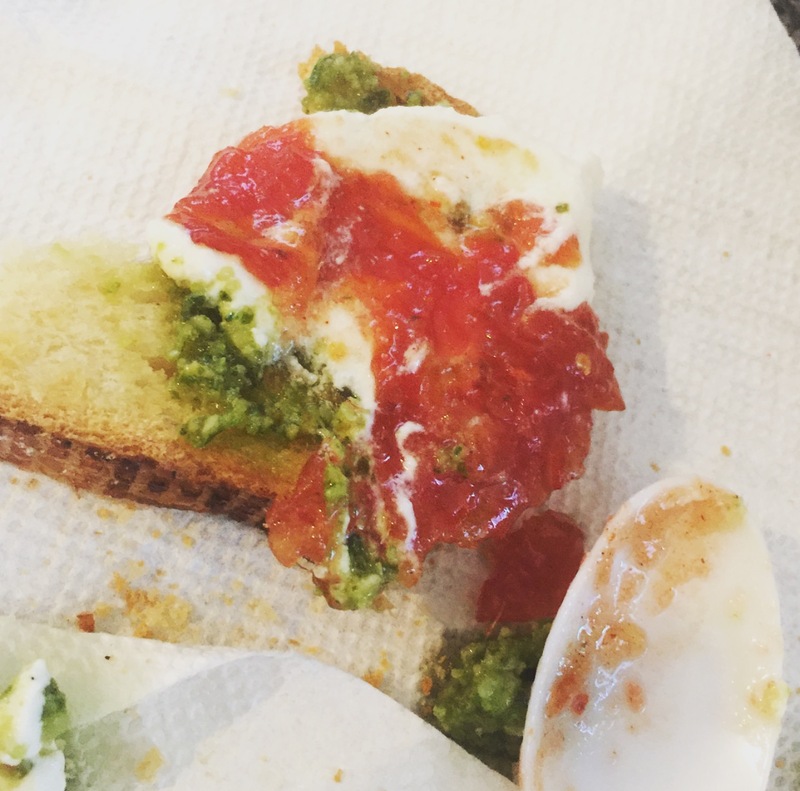 STEP FIVE: Your guests (or just you— again, no judgement here) will need to spread the ricotta-basil-jam mixture on something equally as delicious, so let’s make some crostini. 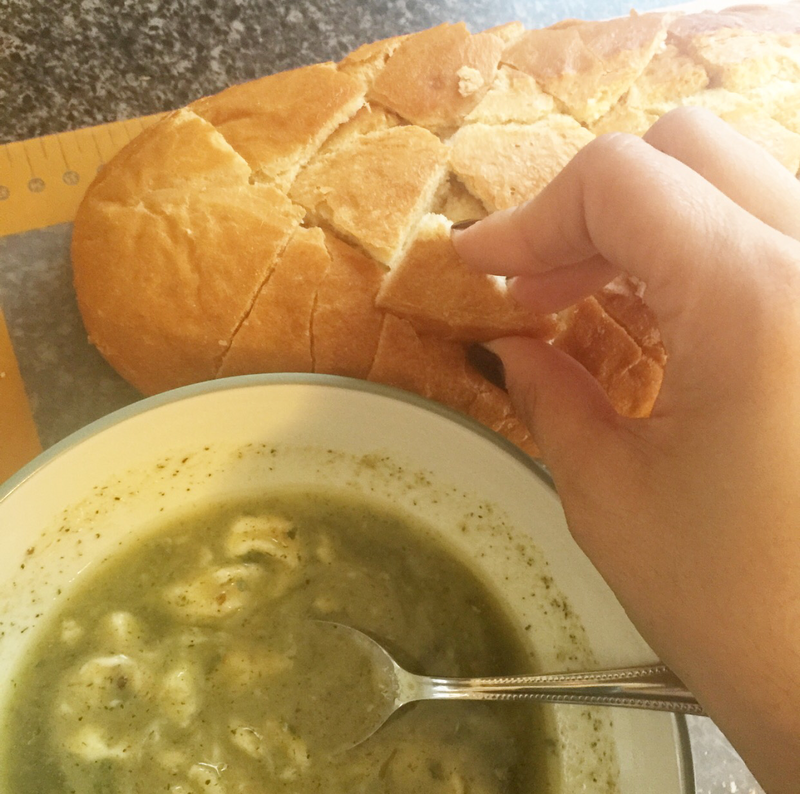 Cut a loaf of crusty Italian bread into thin slices and place on a baking sheet. This step is optional. Bagged crostini from the bakery or deli at your grocery store would be just a good! STEP SIX: Melt a half of stick of butter and brush onto your slices of bread. Serve with your crostini and watch your friends go crazy over this insanely delectable combination of flavors. You can also transform this into a sweet treat by replacing the pesto with a layer of almonds and the tomato jam with peach or strawberry jam. If you wanted to try your hand at a homemade fruit-based jam this is a great recipe. Also, how gorgeous would this look on your holiday table?! It is never too early to start planning! Posted in Food, Recipes, Tutorials, Uncategorized	by STYLEgloss. It’s not too much of a secret that cooking isn’t my favorite thing to do. I don’t dislike cooking. I just hate doing the dishes afterwards. But when I do cook, I usually bring it. I put my game face on and aim to impress. I pretty much accomplished that tonight with this recipie. So this recipie starts out with a pretty innocent cast of characters. 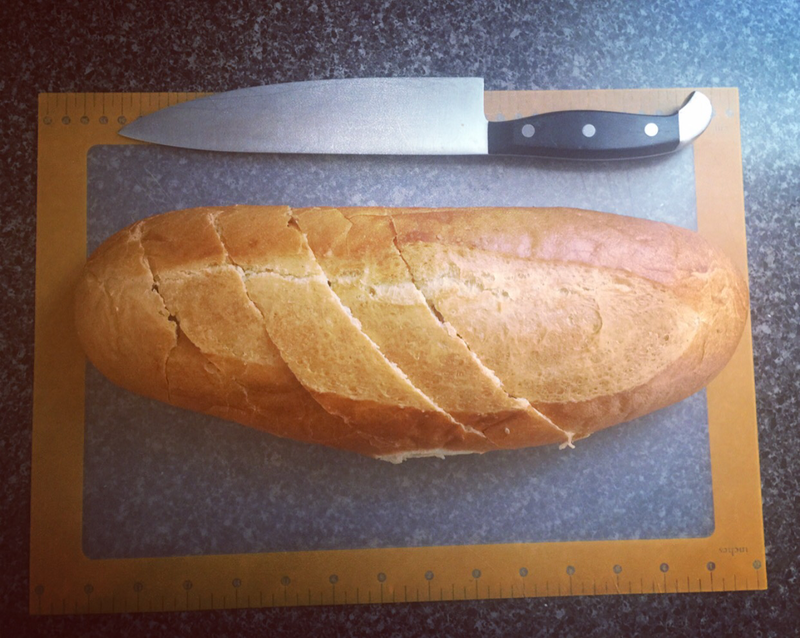 My trusty knife, cutting mat and a fluffy loaf of fresh bread. Oh, and with you preheating your oven to 350. 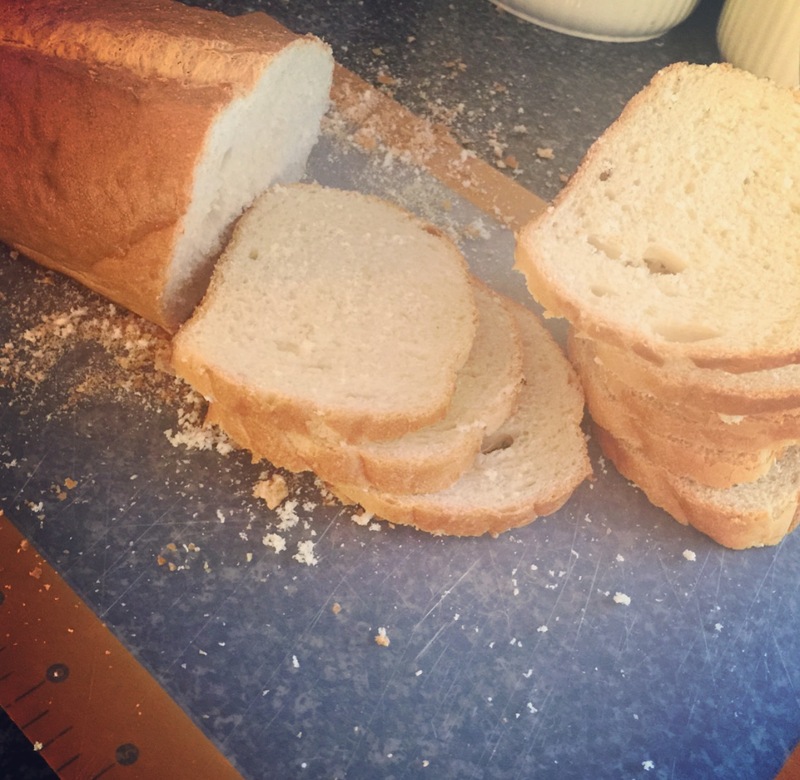 I start by slicing my loaf on a diagonal. 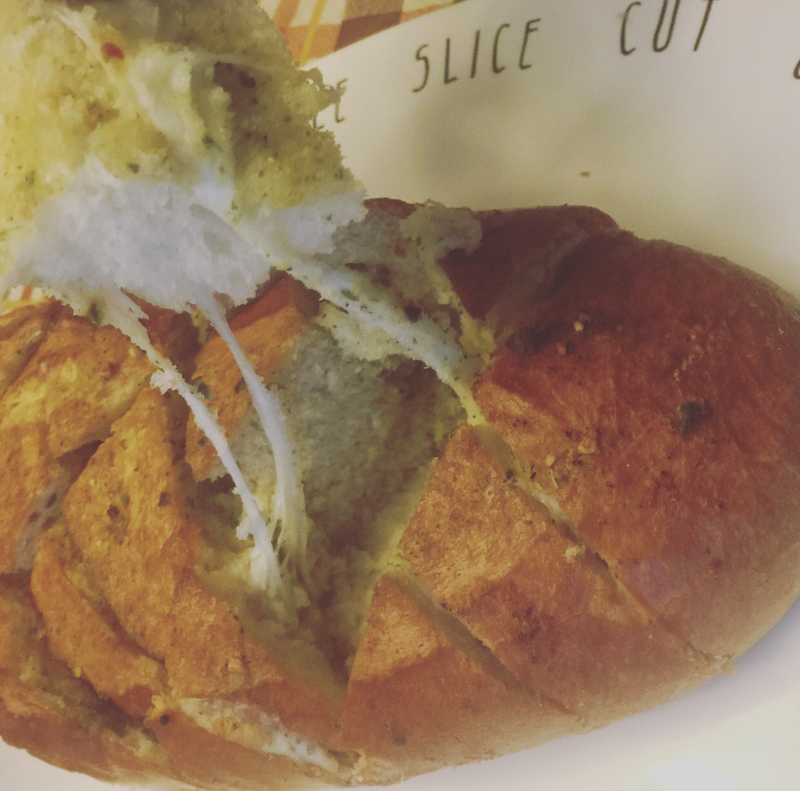 Don’t slice it all the way… More like 3/4 of the way. You want to keep the loaf intact. Once you have sliced down the loaf turn your knife and slice the opposite way so that you create a criss-cross design. Now take a rest. I know all the slicing really hurt my hand, so much so that I needed my husband to take over. 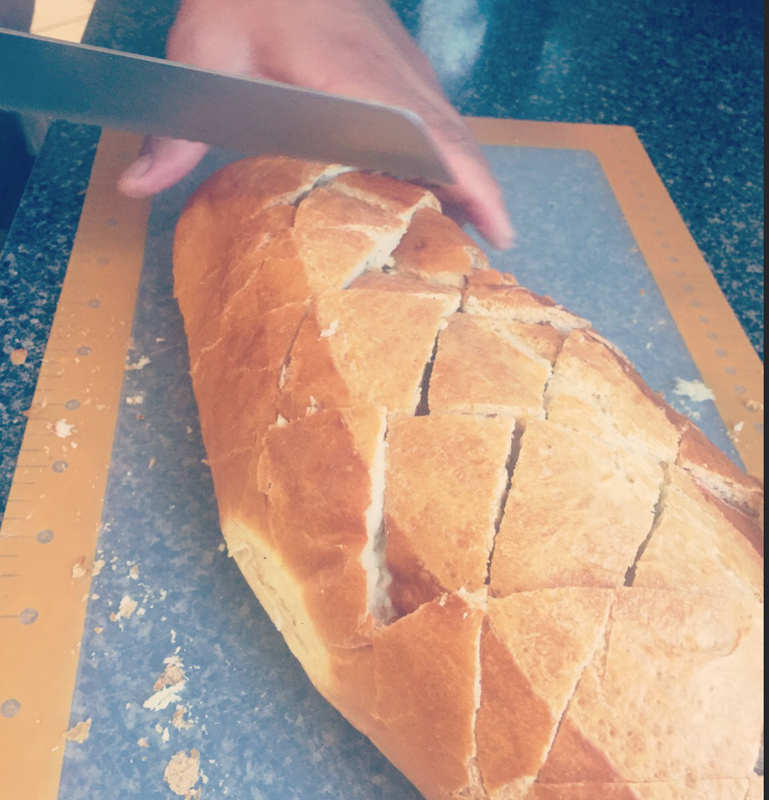 He then pointed out that I was using the wrong kind of knife, so I guess disregard my first photo and use this bread knife instead. Oops! Now it’s about to get serious. Hold on to your seats, kiddos! It’s time to add the cheese! I pretty much rip my slices up into small pieces with my hands and stuff then into my cuts as I go. 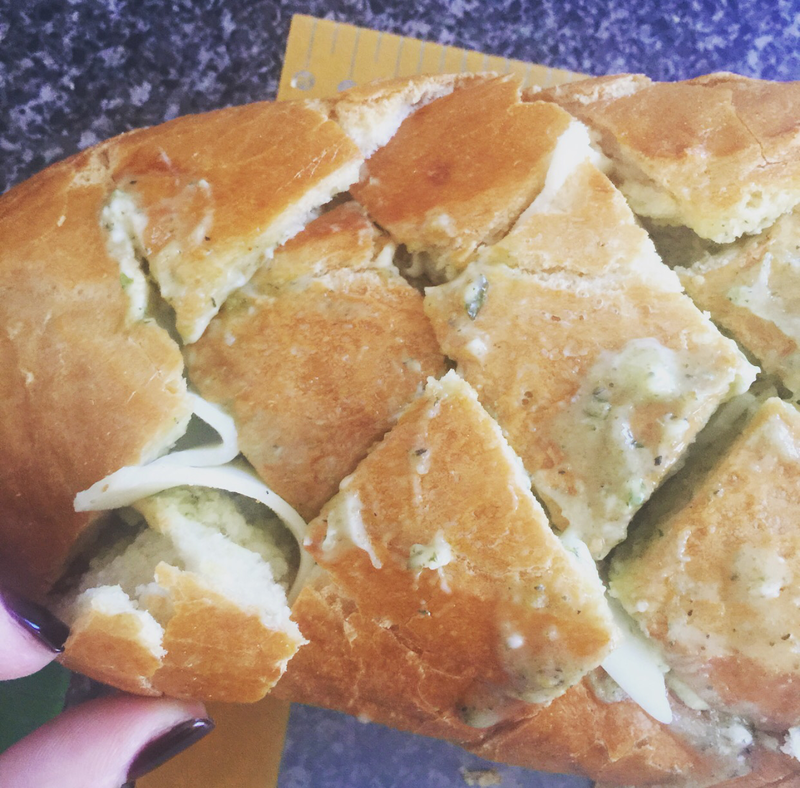 Fill up your bread to the max. Cheese makes everything taste better. You are nearly ready to eat this delicious masterpiece. But not yet. We still need to cook it! Wrap the loaf in aluminum foil (cover the top) and bake for 15 mins. Remove the tin foil and bake for an additional 5 mins, or until the top is golden brown. If you are really adventurous you can add a little shredded cheese to the top just before taking it out of the oven. All finished! I served mine with tortellini but this could be just find as an appetizer or with pizza and beer. You don’t need to be so fancy. Besides, it probably won’t last more than a few seconds. Be prepared for your family to oooh and ahhhh over this culinary work of art. They will think you are so amazing and will start to believe that you are qualified to be a contestant on Master Chef. You’ll have to remind them that it’s just the cheese talking. Seriously. Make it for yourself and see how addicting it is! 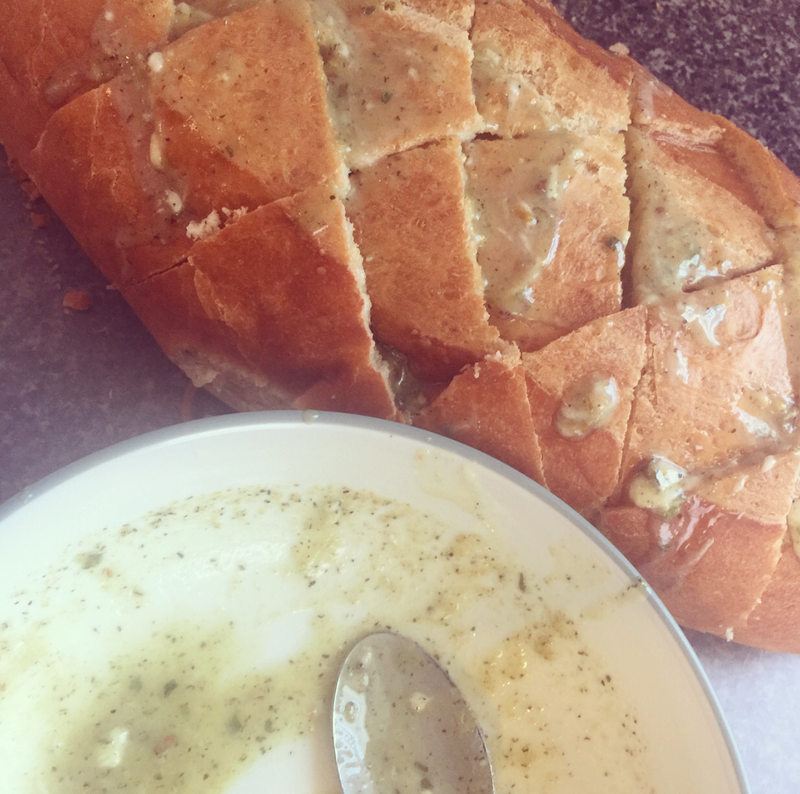 Posted in Food, Recipes	by STYLEgloss. Apples are the yummiest dessert ingredient. 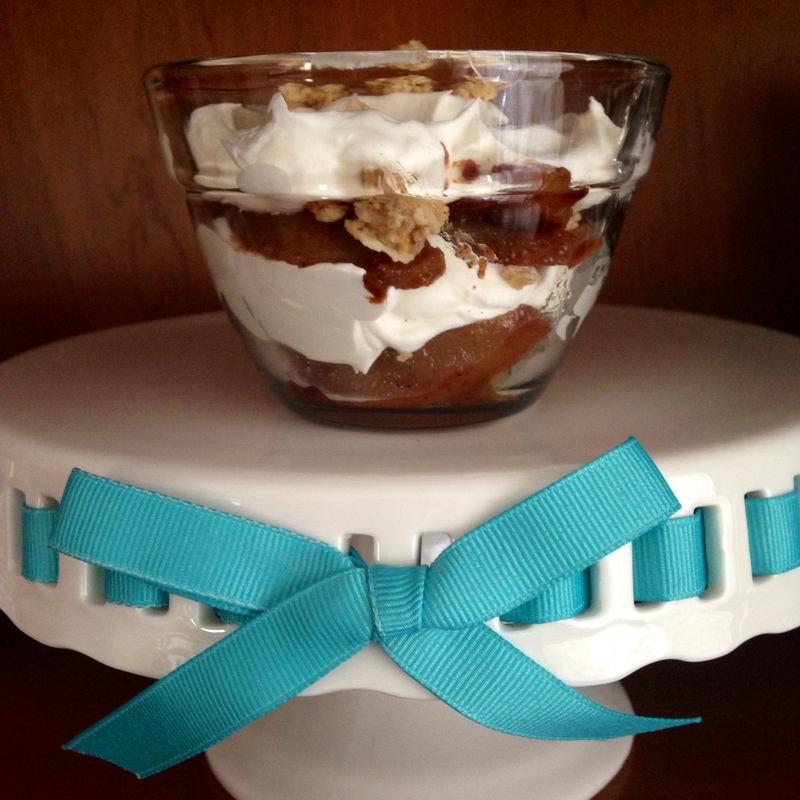 Given the choice between an ice cream sundae, chocolate cake or apple pie I will ALWAYS choose the pie! I always think of fall as the kick off the the year’s BEST and most fattening six months. Between pumpkin spice EVERYTHING (donuts, muffins, lattes- oh my! 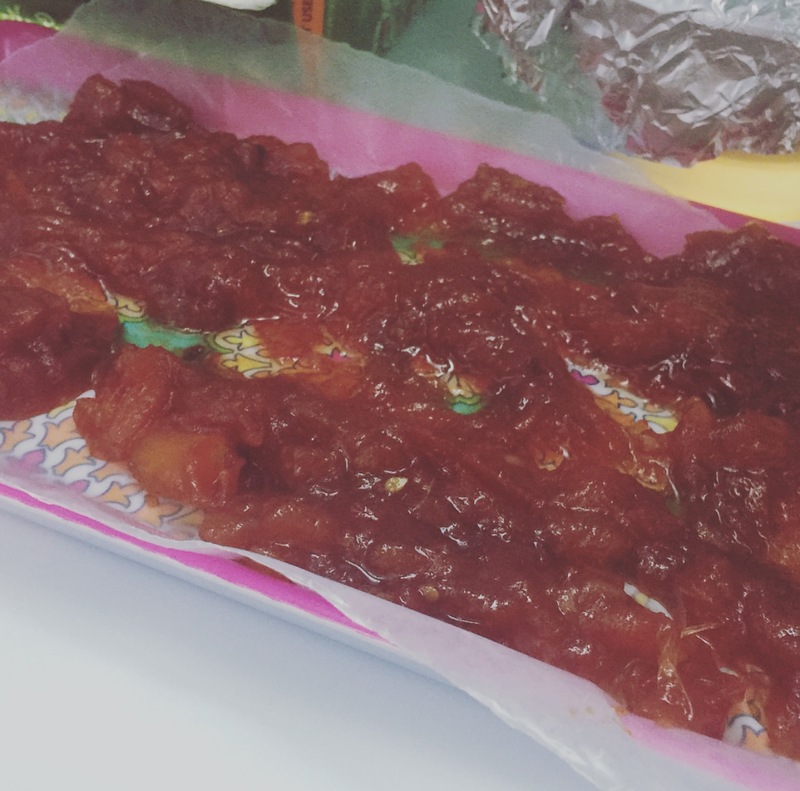 ), Halloween candy, Thanksgiving stuffing and Christmas desserts, it’s no wonder our pants don’t fit after January! 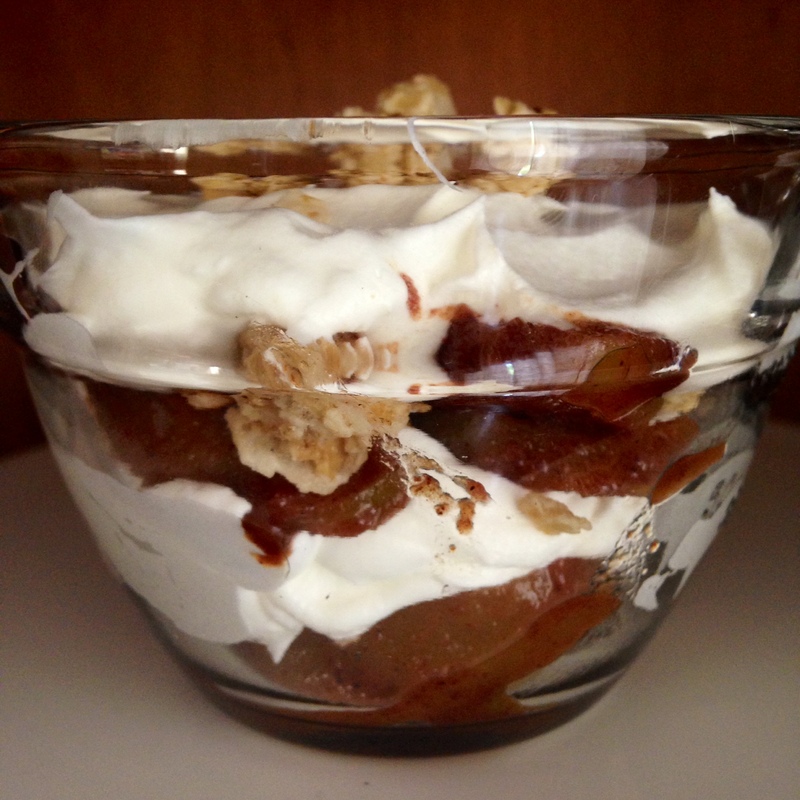 This apple “pie” parfait is simple to make and is crustless! Enjoy the taste of apple pie (yes, even the crunch of a crumb topping) without the calories and guilt. 1. Peel and core your apple. Typical apple corers give you eight pieces. Go ahead and cut every piece in half, giving you 16 slices when you are finished cutting. 2. Put your apple slices in a bowl. Add cinnamon, nutmeg, vanilla, Splenda and salt. Toss to coat. 3. 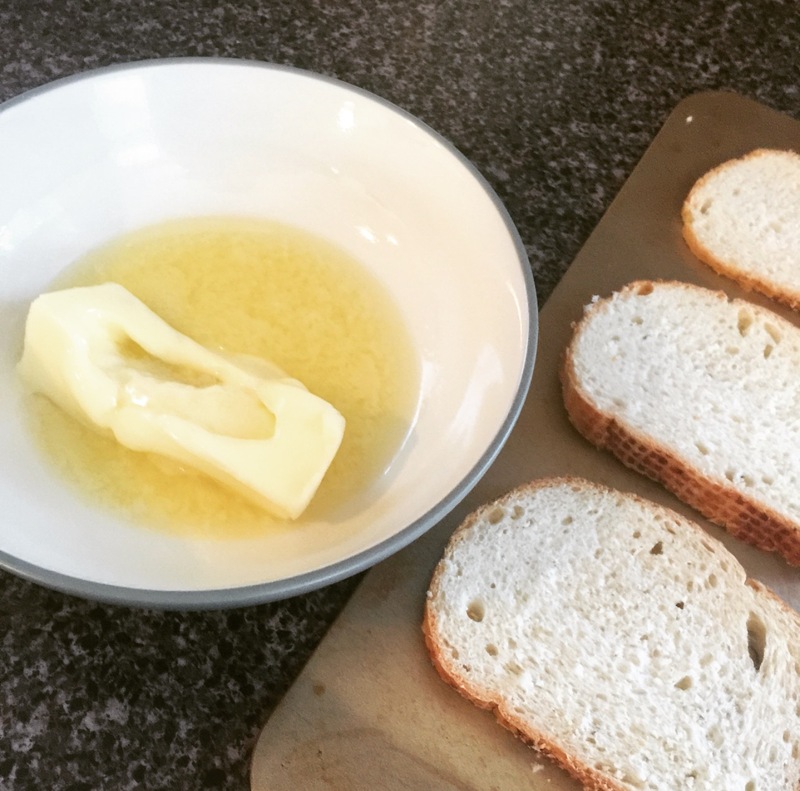 Melt butter in a frying pan. Add apples. Stir to coat with butter. Add water to pan and cover. The water will keep the apples from drying out. 5. 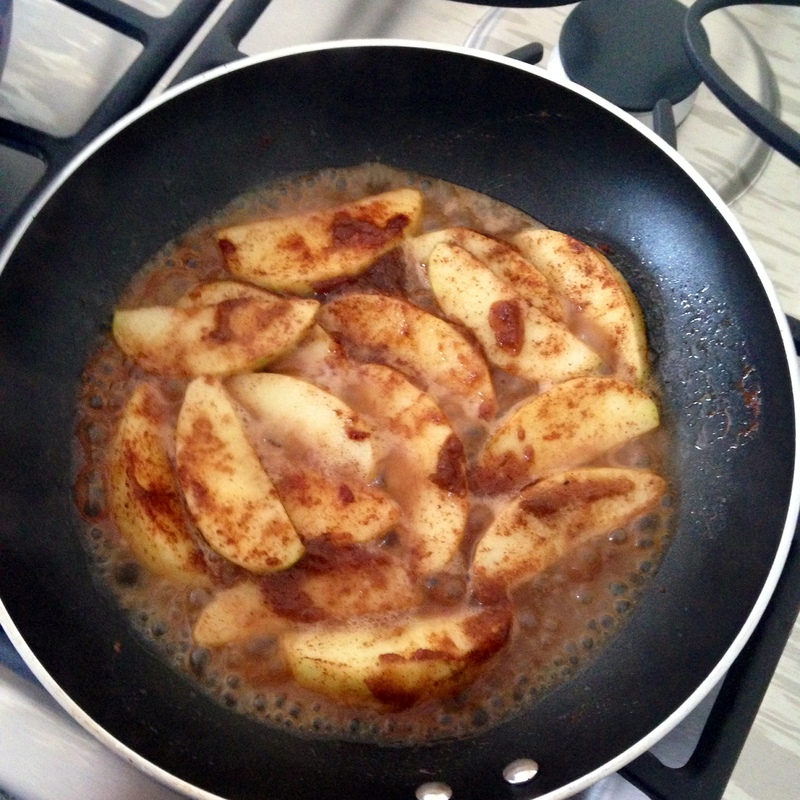 When your apples are done remove from heat and place 5 slices in a small, shallow bowl. Top with a small sprinkling of granola (seriously 1/2 a teaspoon is enough! You WILL taste the crunch!) and then a dollop of whipped topping. Repeat one more time. 6. Enjoy the amazingness of this guilt free dessert. These little bowls are from Pampered Chef. They are the 1 cup prep bowls and come in a set of 6! Posted in Food, Home, Recipes	by STYLEgloss. Thanks to the nature of the fashion industry I am always a season or two ahead. As everyone is enjoying the summer sun this week, I am already focused on buying fall clothes for my store and (starting in August) prom dresses for the spring of 2015! It’s not my fault that all I can think about right now is fall- especially when I keep hearing the words “Christmas in July” being thrown around this month. That means we are SO close to boots, sweaters and PUMPKIN EVERYTHING! 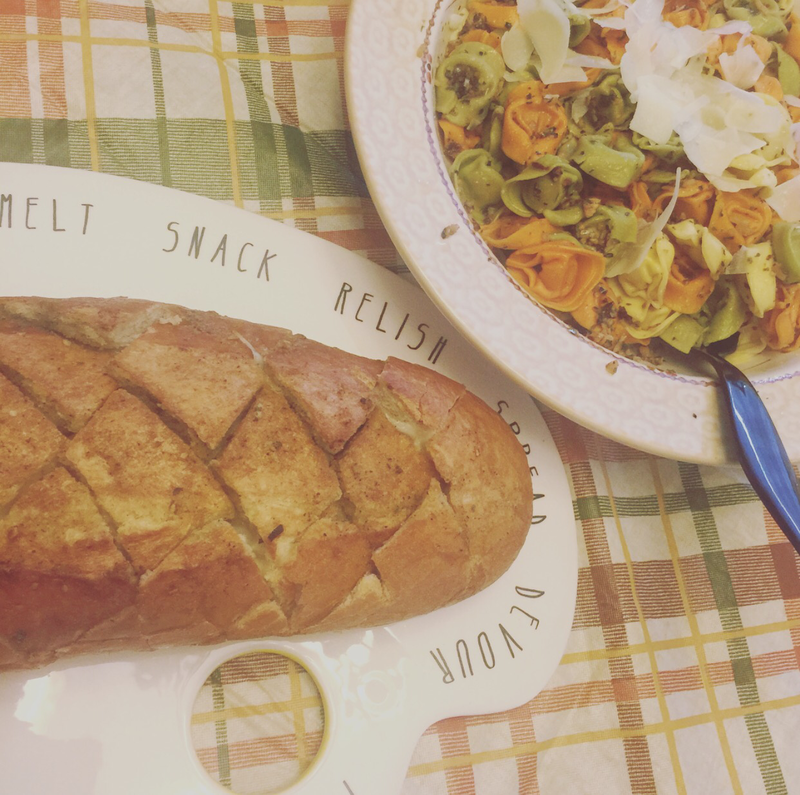 Since I am dreaming of pumpkin muffins and lattes, I thought I could satisfy my cravings by making a feast of comfort food that incorporated one of my favorite fall dishes. 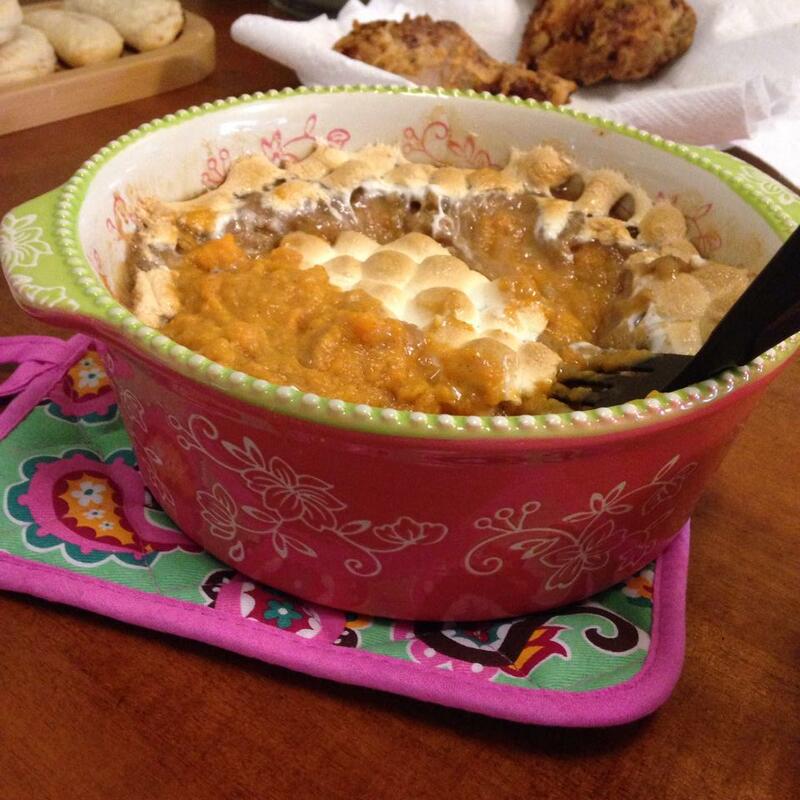 I have a soft spot for sweet potato casserole– you know, the kind with all that gooey brown sugar and marshmallows? Sure, you could pick up a whole batch of this delicious piece of heaven at Boston Market on your way home, but this homemade version is just so much better! I love this recipe from Rebecca Lang’s Around the Southern Table. In fact, I love her whole book! Download it now or pick it up at your local bookstore and you will instantly see why it will become a go-to in your kitchen. The one thing that I changed about Lang’s version of sweet potato casserole was the topping. She uses crushed gingersnaps to create a crumbled topping but Chris doesn’t care for them. Instead I made my own crumble (recipe below). It is a generic recipe that I think everyone should know how to make. You can use this topping for tons of things- cobblers, crumb cake, crust-less apple pie. The best part is that it is easy to make and even tastier to eat! Not sure what else to serve with your sweet potato casserole when it’s not November? I made fried chicken and herbed biscuits to go along with it! All recipes were from Lang’s book. Mix together flour, brown sugar, nutmeg and cinnamon so that your mixture is a light brown color. You should not see any white spots. Add your butter by mixing it into your dry mixture with your hands. You should eventually see the mixture turn into what looks like crumbs or crumbles. Use this topping for pies, cakes and cobbles . Simply top your dish with it prior to baking. Variation: Add 1/2 cup oats or honey granola for more texture. Make your casserole ahead of time! Prepare the base and then make your topping just before you are ready to bake. PS: My casserole dish in the photo above is Temp-Tations from QVC. The whole line consists of stoneware pieces that go in the oven, microwave, dishwasher and are pretty enough to serve from. This color combination was a spring limited edition but this set is the same one I have, just different color options. Fresh from the oven and ready to glaze! 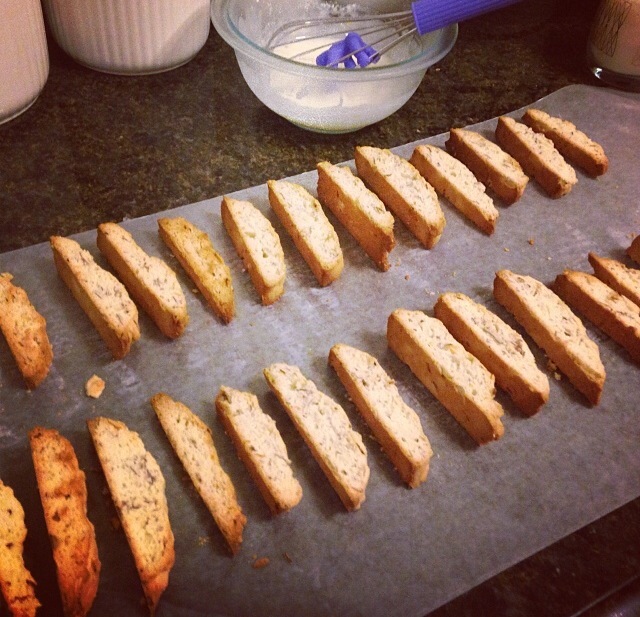 These biscotti are slightly browned at the edges but are still chewy! Looking for an easy dessert that travels well and will impress your family and friends? These lemon glazed biscotti are perfect! 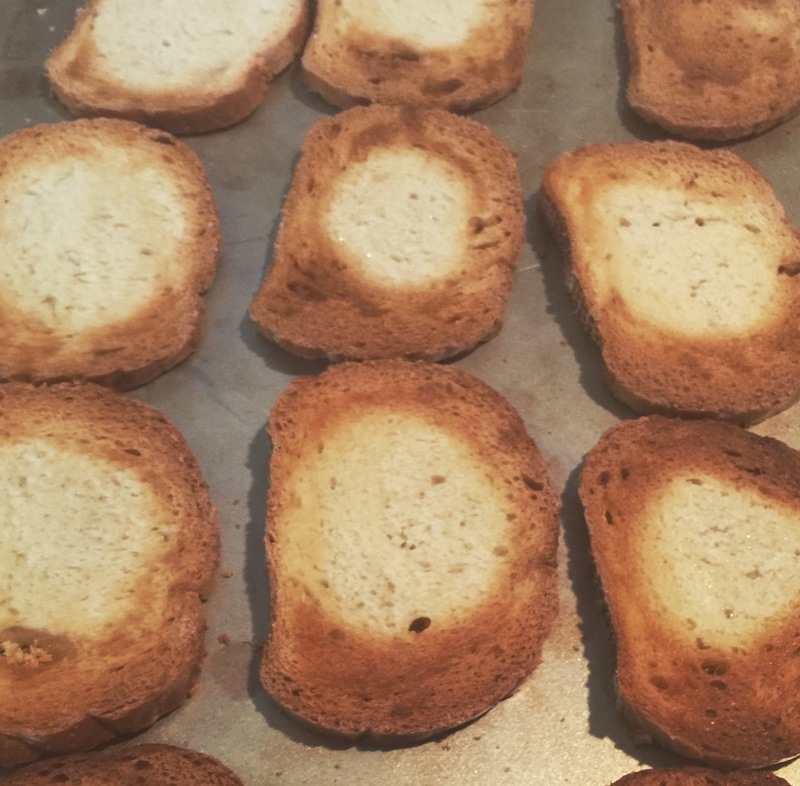 They are best served fresh-from-the oven so that they are warm and chewy, not hard and crunchy like typical biscotti. My husband’s recipe for cannoli cream is a great compliment to these cookies. The warm cookie against the cool and creamy cannoli filling tastes like heaven in your mouth. If you serve this at your next party your guests will think you slaved over a hot stove and a KitchenAid all day but the truth is this dessert is super easy to make! 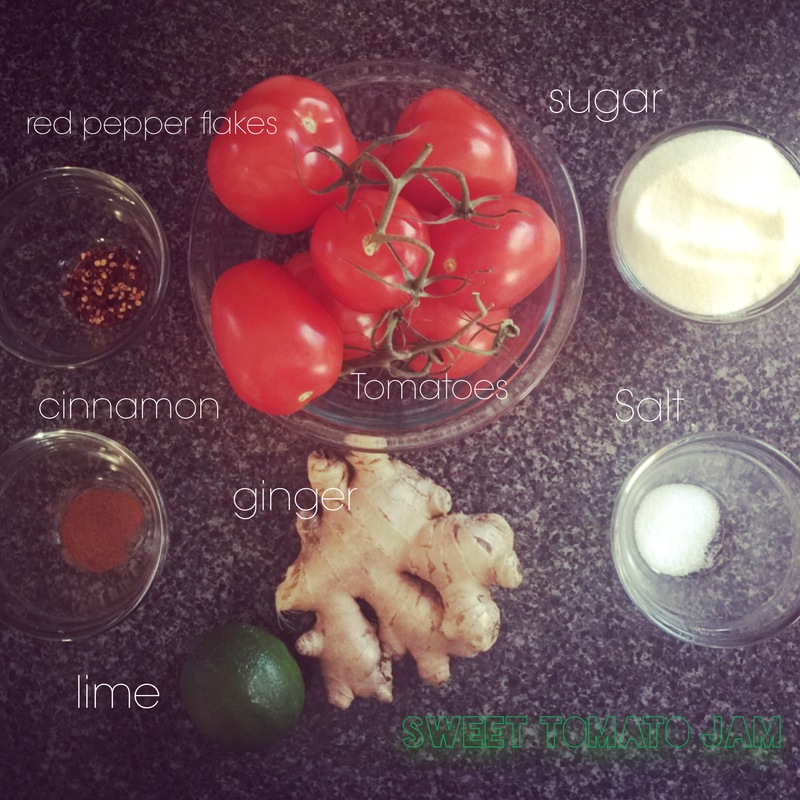 Here’s the recipe and some tips from me to help you along! Preheat your oven to 350 and prepare a baking sheet in your favorite way. I like to use cooking spray but you could line with parchment paper or use butter. As with most cookie recipes start out by mixing dry and wet ingredients separately. Cream your butter and sugar with a hand mixer until it is light and fluffy. If you under-beat these two ingredients your cookies will be grainy- do not skip or skimp on this step! Add your eggs, one at a time. Then add the lemon zest and vanilla. Set this aside and take out a new bowl to prepare your dry ingredients. Sift your flour, baking power and salt together. Slowly add this mixture to your wet ingredients (about one cup at a time, stopping to mix it in entirely before adding another cup). Mix in almonds (don’t forget to toast them before!). Your dough will be slightly sticky- that’s OK! Your cookies will still come out just fine! Lay your dough out on a floured surface and knead until the dough holds its form. Then separate the dough into two portions. Form two logs on your baking sheet. Bake for 25 minuets (don’t forget to set a timer- this is important). After 25 minuets of baking it’s time to actually make your dough into cookies! Take your logs out of the oven and lower the temperature to 325. Let the logs cool slightly on a cutting board for about 5-10 minuets. Take a sharp chef’s knife and cut your log into strips, creating your cookies. This recipe makes a small batch (NOTE: double this recipe if you are feeding a crowd!) so I like to cut mine on the thinner side. There is no right or wrong way to cut them. Place your cookies back on the baking sheet and bake for 5 minuets on each side, for a total of 10 minuets. Let them cool slightly (so they are not burning hot but still warm). Prepare your glaze by mixing all of the ingredients in a small bowl. It should be thick but still look and pour like a liquid. Glaze each cookie on wax paper and let dry. Transfer to a tray and serve with cannoli cream (see below). 2 small containers of mascarpone cheese (approx. 16 ounces) *NOTE: You can find this Italian cream cheese in most supermarkets. If all else fails try an Italian specialty shop- they are sure to have it. The best part about this recipe is that most of the measurements are either the whole or almost the whole container, so you can just throw it into your stand mixer without measuring anything out! Start off by mixing your ricotta and mascarpone cheese together. Add vanilla, then add the powdered sugar. Your mixture will be sweet, but not sweet enough yet! We will need to thicken and sweeten the cheese. 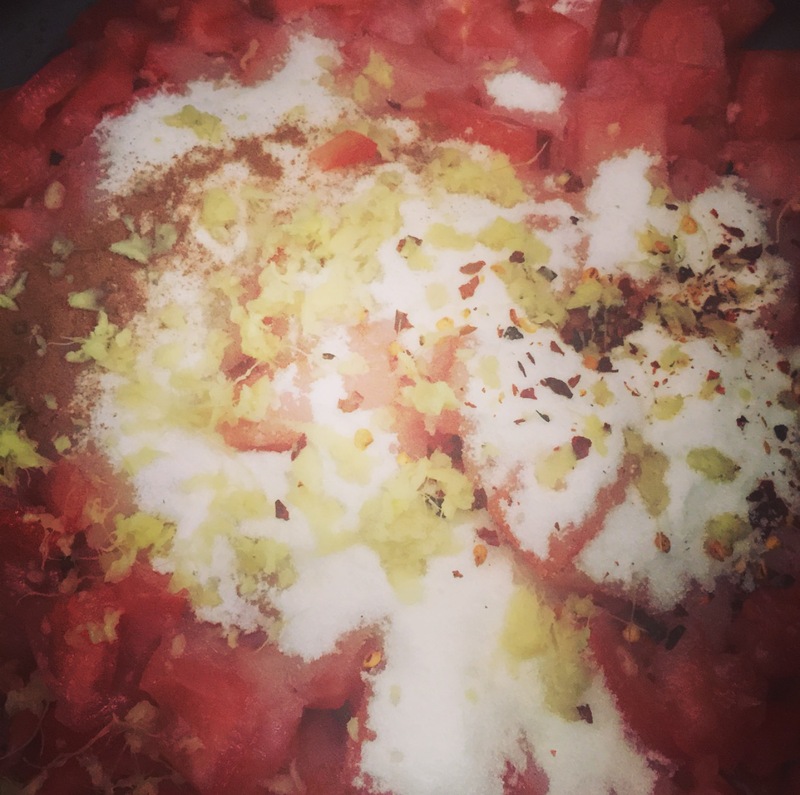 In a bowl mix together your water, cornstarch and white sugar. Add to the cheese mixture. Everything should begin to thicken. 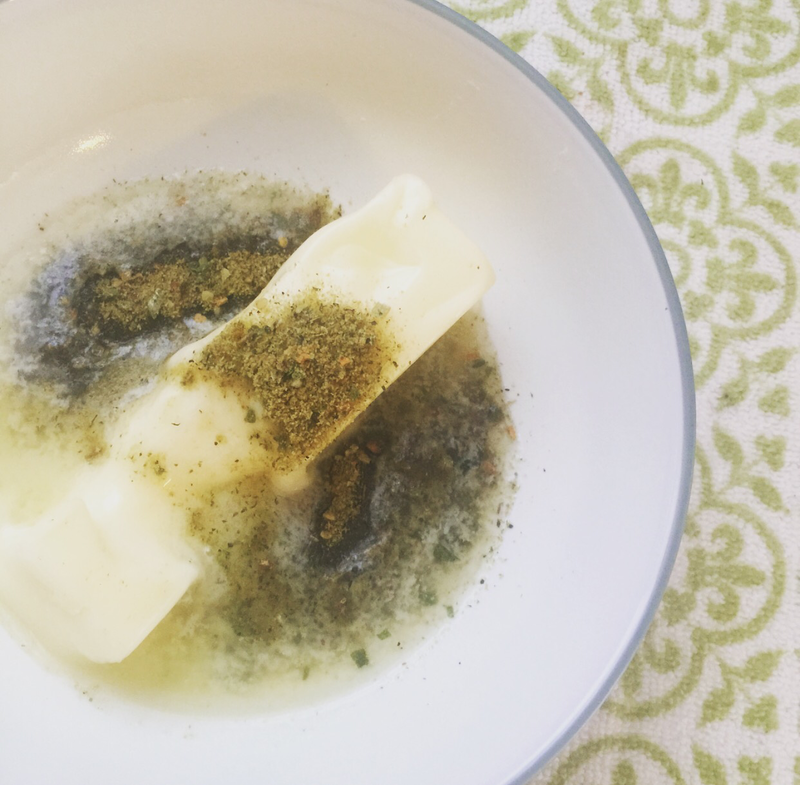 Here is where you will need to exercise a little cooking creative freedom… If you feel like your cream is still too loose (it should be stiff enough to scoop up but creamy enough to spread as you would a frosting) add another tablespoon of cornstarch mixed with three tablespoons of water. If you feel like it is not sweet enough do the same with your white sugar and water (in the same proportions). Do this until your mixture looks creamy enough and is sweet to your liking. Let the mixture chill for at least a half hour before serving. I like to let it sit overnight, but if you are making it the same day as your event a half hour will do. Sit back and enjoy as the endless compliments come in!! A revelation about 2014 resolutions…. Posted in Beauty, Decor, Fashion, Food, Health, Tips & Tricks	by STYLEgloss. 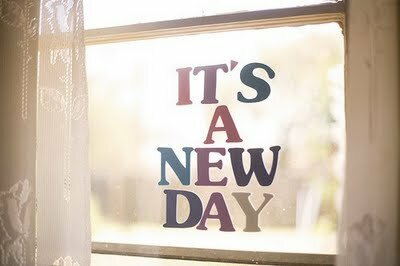 With a new year comes the promise of a fresh, new start. 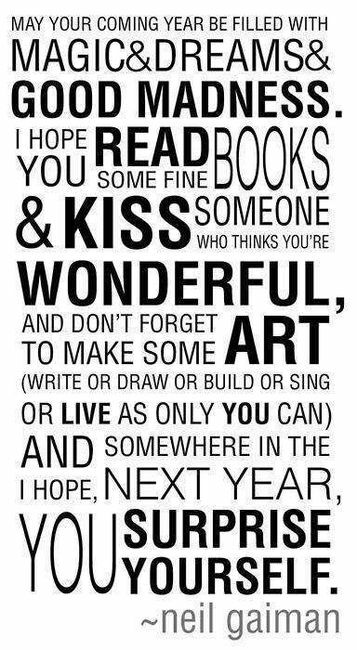 As we turn the page on 2013 and settle into the first days of a new year, we are all thinking hard about our resolutions. If you haven’t thought about it, here’s some food for thought: What do you resolve to do in 2014? Or not to do? Or to do more of? It’s no secret that year after year the number one resolution among Americans is to “get healthy” (loose weight, work out more, eat right…). Don’t believe me? Fine. Read up on the top 10 resolutions here. It is also no secret that the number one resolution that people do not follow through with is the same one that they are so hopeful and dedicated to on the first of the year. By the third Friday of January most people will have given up or failed at the promise to take better care of their health. What, you don’t believe that either? All of this negativity surrounding resolutions got me thinking about how we can all follow through with goals in the upcoming year. When you tell someone about your goals for 2014, no matter if they are health related or otherwise, you will probably receive snarky remarks and commentary about how “that’ll never last.” Don’t fret! Prove everyone wrong (and maybe even the tiny voice inside your head that shows up just in time to doubt your abilities during time of weakness) with a few easy but super helpful tips for making those resolutions last until 2015– or even further! If you think of your resolution in weekly goals instead of a “year long project” you will feel less daunted by the tasks at hand. Rather than saying “I plan to loose 40 pounds this year” try breaking that weight loss up into small milestones. Set smaller goals in the beginning (say, one pound per week for the first three weeks) and then increase your goal as you go. If you are patient and remember that a slower yet steady and consistent pace will win the race then you will meet your goals in what will feel like no time! Keep a journal! Whether you are planning to loose weight, eat more vegetables, learn to play an instrument, try new recipes, learn to knit– whatever your resolution is, if you write it down you will be more motivated to continue! Write down all your goals (weekly, monthly and yearly) on the first page. Seeing your goals can help you manifest them. Each time you work toward achieving your goal write down what you did, how you did it and what you might have learned. When you hit a goal (IE: losing two pounds, learned to play a full song, completed a Pinterest project) dedicate a whole page to your milestone. Seeing your progress will motivate you to continue! We all mess up. It’s human nature. But don’t fall into the trap of excuses! If you have a sugary, fattening breakfast and continue to eat poorly throughout the day because you “already messed up so might as well indulge…” you are only digging a deeper hole. Think of your breakfast as a small pothole- you can still walk out of the hole on your own. The more “indulgent” behavior your engage in the deeper your hole will become. Eventually you will be standing in a trench and won’t be able to pull yourself out. It’s better to stop while you’re ahead and can still walk away. You can apply this metaphor to any goal, big or small. Follow accounts on social media that have similar interests in mind. For example, seeing healthy recipes, before and after photos and others who are trying to loose weight on your Instagram feed can motivate you. If your goal is to cook more follow popular chefs on Facebook. Keep a file of crafts you want to tackle or start pinning them to a board on Pinterest. If you are ever at a lost for a way to continue with your goal or can’t think of a healthy, quick dinner you will have an arsenal already built up for those times when you just feel like jumping off the wagon. Cook some of the recipes I have pinned! What is your resolution? Leave it in the comments!